Nobody ever accused Democrats of being either practical or untheatrical. 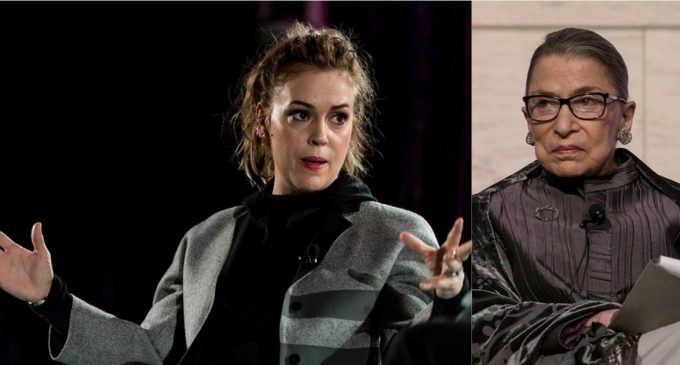 Hollywood actress and leftist activist Alyssa Milano is certainly one who relishes in liberal temperament to place emotional reactions on a pedestal. Justice Ginsburg, 85, was hospitalized Thursday morning after falling in her office the day before which fractured three of her ribs. It’s not the first time that Ginsburg broke ribs and when she did she continued to work despite considerable pain. It reminds me of my grandmother breaking her arm badly during a fall in the shower, taking the time to properly make herself up before calling anyone and not showing the slightest hint of pain while in the hospital. It was a much tougher generation. The liberals of yesterday make the RINOs of today look prepubescent. Turn the page to read what Milano is offering up to Ginsburg because of her fall.